With the recent debut of the revised DCI.org Web site, a new feature is available to allow members of Drum Corps International's Fan Network to leave their own insights and comment on featured news stories. This new way of communication, called DCInteract, allows users to leave comments, ideas, supporting information, or anything else they have to say about a particular article. To be able to use this feature, you first need become a member of DCI.org's Fan Network. To do this, go to the "FAN NETWORK" tab at the top of the Web site. When that page comes up, you can choose to sign up for a complimentary Gold Membership which is free, or for a Platinum Membership which gives you exclusive access to premium content including live WebCasts, videos, discounts on downloadable media, and more. 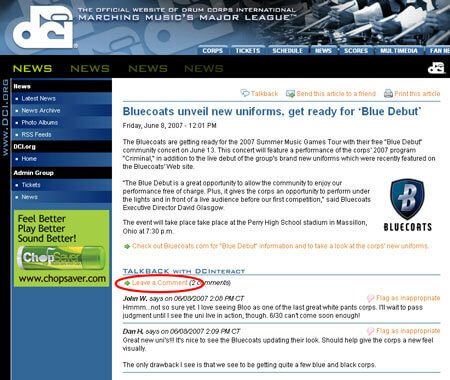 Once you have registered and logged into your account, you can go to any article on DCI.org and leave a comment. To do this, scroll down to the bottom of the page and click the "Leave a Comment" link under the "Talkback with DCInteract" heading. After you have written your comment in the box that pops up, click "Submit." Once submitted, your comment will be posted under the article and you're done! If you want to comment on a different story at another time, all you need to do is login at the top, right-hand side of any DCI.org Web page. This new feature, and DCI's Fan Network, is designed to optimize your experience with DCI.org, so you can communicate with Drum Corps International and other fans to discuss your favorite corps, and the information you care about. Feel free to test out DCInteract below and leave your own comment for people to see. Enjoy!